Considering a trip to Dubai and in need of some top tips from someone who is really in the know? 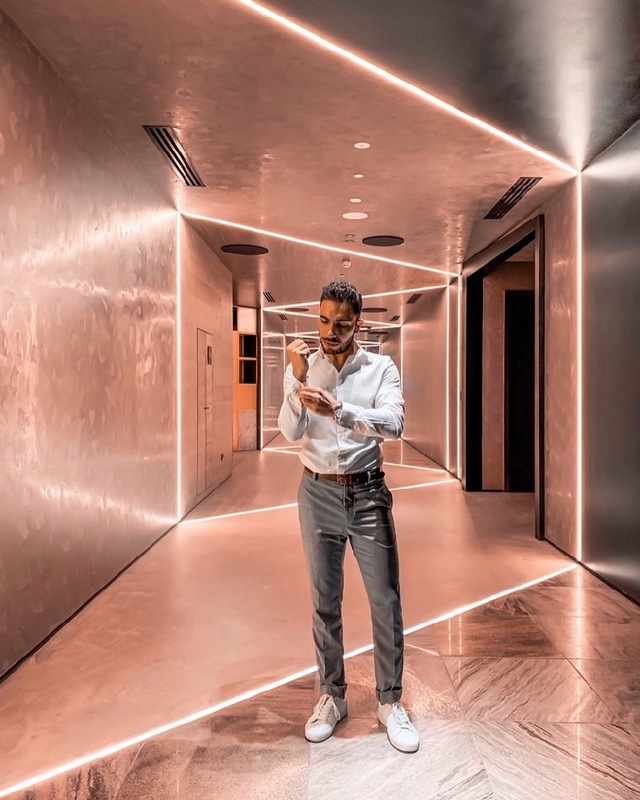 Then read on and discover more about this five-star destination in our interview with content creator and hotel aficionado Musbah Haddad. Please tell us about yourself and where your love for Dubai originated. My name is Musbah Haddad, better known with the nom de plume on social media platforms ‘iamhaddad’. I come from Damascus city in Syria. A hotel aficionado who chose Dubai, an affluent city that is home for international travellers and cosmopolitan society, to be abode for the past fourteen years. 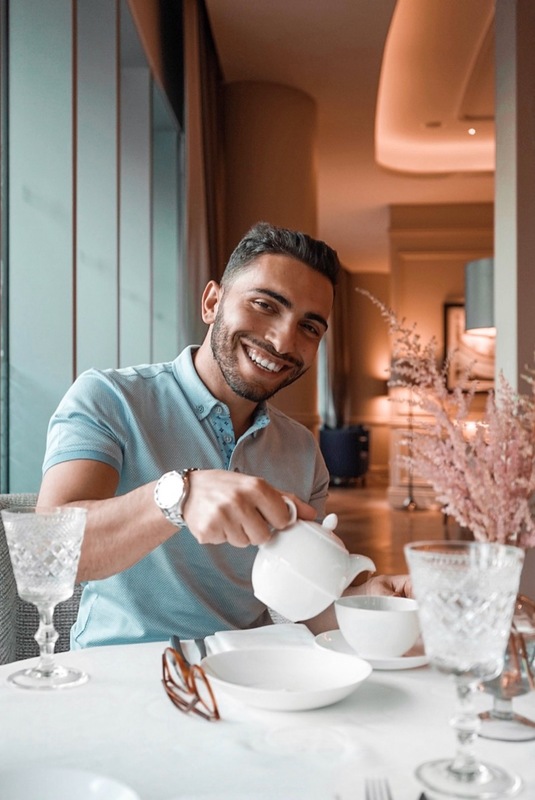 Being a long term resident in many five-star hotel apartments across Dubai made me adept at reviewing high-end hotels and properties while developing fondness and an affinity for luxury and lavish lifestyle. I have studied Software Engineering but not long that I discovered my love for photography and videography. 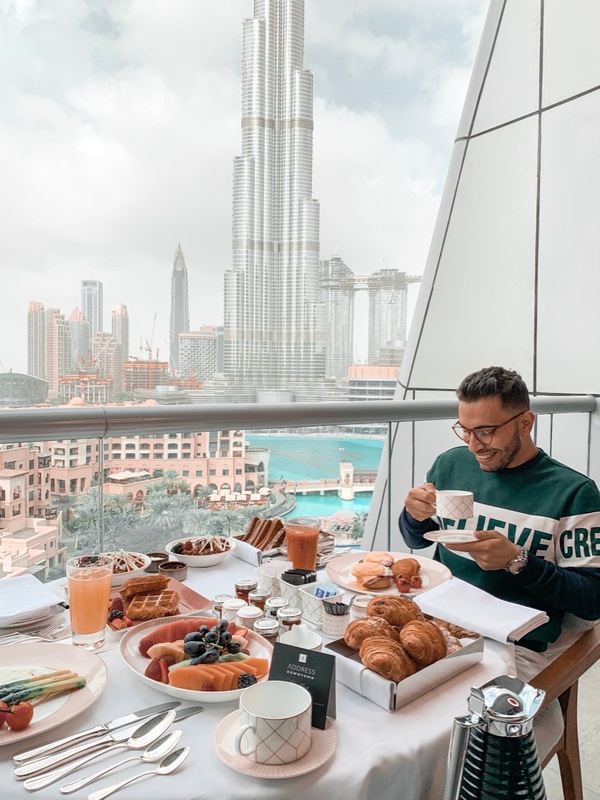 Dubai has extremely high standards when it comes to the luxury market, tell us more about your favourite places and how they deliver unabashed luxury. Address Boulevard & Address Downtown in particular are my favourite places to spend my time at. They capture the city’s open-minded, cosmopolitan spirit while giving you a homey atmosphere by introducing the-first-of-its-kind concept ‘The Restaurant’. A creation of a labyrinth of rooms that feel like softly-lit cocoons, all entirely unique and built-in harmony with their astonishing natural surroundings. Tradition continues in service and sustenance. Staff dressed in smart attire offers renowned local hospitality. Seldom does a restaurant feel so comfortable, and yet so utterly sumptuous and luxurious: the waiters come and go as though they had wire-tapped our brainwaves, somehow appearing just when needed and floating away the same way. I am almost every other day there, either for a morsel in Bernardaud plate or simply a cup of coffee in a Wedgwood Fine Bone China cup. Talk about luxury. Describe a typical day for you – if such a thing exists. On weekdays I wake up around 6:30 in the morning, have my coffee then straight to the gym for a HIIT cardio on the treadmill. I then have breakfast, check my email and start editing some videos for clients. Later in the day I would hangout with my friend Yazan who shares the same passion for photography and videography. We would scout out for places to shoot while developing ideas for our Instagram content. Weekends are meant for hotel stays. It is not hyperbole if I said I feel home when I am a hotel. What do you love most about being an ‘instagrammer’ ? Sharing my love for hotels with people who have the same mindset. What you see on my Instagram page is my lifestyle with zero sophistry. Why do you think people enjoy your content, what makes you stand out? To be forthright, people enjoy my content simply because it is visually appealing with identity and character. My Instagram stories are always unique and well-curated. I wanted my Instagram to be a rarity among other instagram profiles: one you can leaf through enjoyably while getting transported to a world of unabashed luxury. I hope about time people would get to understand that investing in a quality content is long lasting and worthwhile. Passion, soul, creativity and sophistication are the main ingredients of @iamhaddad. 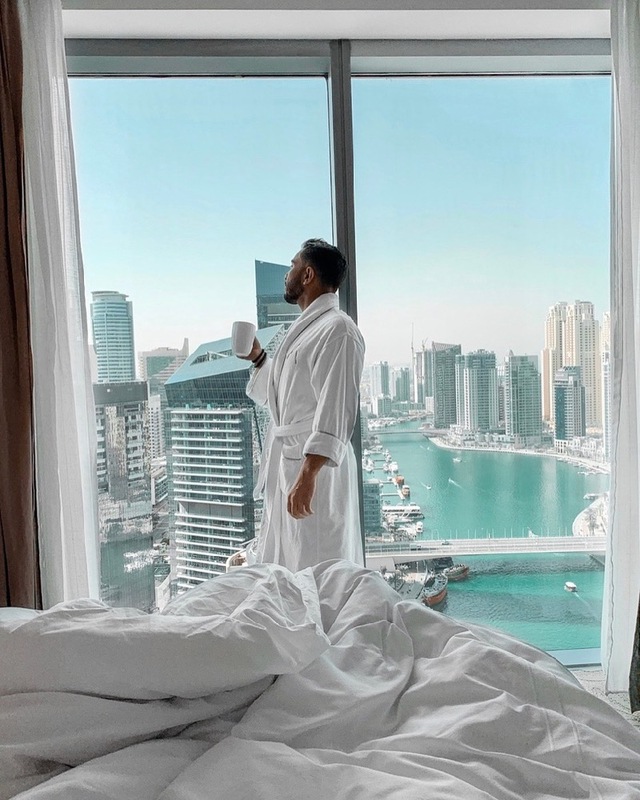 Where has been your favourite place to wake up to in Dubai so far and why? I reminisce about the days when I used to be a resident at the World’s Tallest Tower, Burj Khalifa. 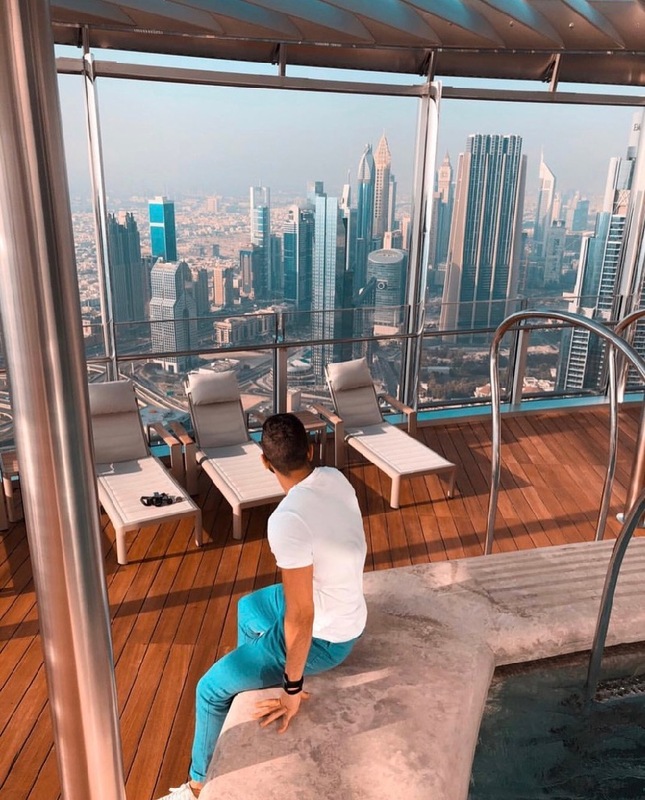 My bedroom has enjoyed panoramic views of the Dubai Fountains and the skyline. As soon as the sun flare enters my field of vision, the to-do list in my mind slides away into nothing. And that is no embellishment. Where is still on your travel to do list and what appeals so much about this place? Alaska. Cannot stress enough on how much I love the cold weather. It might be paradox since I live in Dubai and all we have is summer all year round but I truly enjoy winter. Now from someone who does enjoy taking photos and footages I think it will be a great opportunity to capture the concentration of glaciers, energetic sled dogs, or simply going on a helicopter tour to capture the rare wildlife. And finally if one of our readers is heading to Dubai what are your recommendations for must do things to do, places to eat and drink and places to stay at. For more hotel ideas in Dubai, read our luxury hotel guide.